Clockwise from top left: Knotty Trellis worked to-and-fro, Knotty Trellis worked left-to-right, Corded Trellis worked left-to-right, Smooth Trellis worked to-and-fro. Centre: Spiral Trellis. 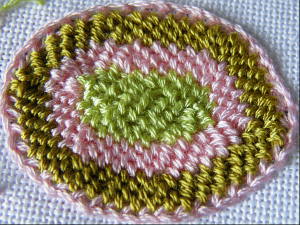 The trouble with Trellis Stitch is that it isn’t just one single stitch. It’s a family of needle-made fabrics and detached fillings based on two quite different stitches: coral knot stitch makes a knotty fabric, while twisted chain stitch makes a much smoother fabric with a texture rather like bricking. But, as with the plain and purl of knitting, the right side of one fabric is exactly the same as the wrong side of the other. And none of the variations have acquired proper names, except for spiral trellis, which we’ll come to in a moment. No wonder people get confused! 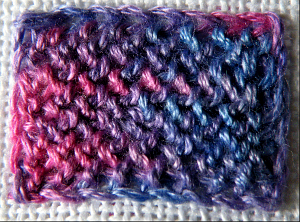 Coral knot stitch is usually just called ‘coral stitch’. But as ‘coral stitch’ is also another name for what is normally called feather stitch, I’ll leave the knot in the name. Coral knot stitch is just a row of coral knots. 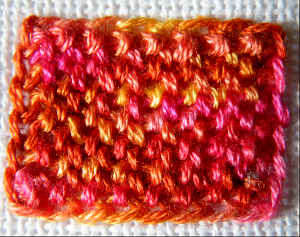 In the stitch books, coral knot stitch looks much like it does in the top row of this sample. This is 28 count fabric and I’ve used three strands of stranded cotton, I’ve set the knots three threads apart and each stitch picks up two vertical threads of the ground fabric. 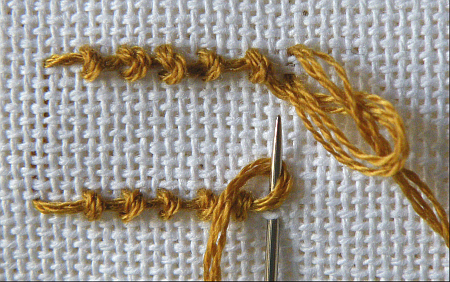 Twisted chain stitch, as shown in stitch dictionaries, doesn’t look much like the stitch in the bottom row of the sample. It usually looks more like a chain stitch with a twist (surprise, suprise). 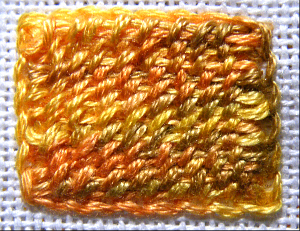 This small sample is worked in the same proportions as the coral knot stitch in the row above: each stitch picks up two vertical threads of the ground fabric and the stitches are three threads apart. It is more obviously a row of knots when worked like this, but it is exactly the same structure as normal twisted chain. 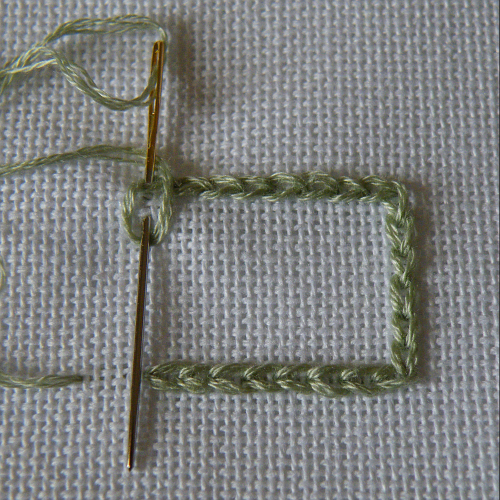 And these are the sort of stitch proportions that we want for the twisted chain when working trellis. Trellis fabrics can be worked as needlelace, punto in aria – partly, or even totally, detached from the ground fabric. But I am dealing here with their use as detached fillings, which are (despite the name) attached at the edges and used to fill a space. When worked as a detached filling stitch, the first and last row and the sides generally pick up the loops of chain stitch, back stitch or some other edging stitch rather than entering the ground fabric directly. Chain stitch is particularly useful, because well-formed chain stitch worked in the same thread will give you just the right spacing for trellis stitch. That’s very handy when you want to experiment. If the thread won’t make a nicely shaped chain stitch: neither too thick nor too skinny, too stiff nor too irregular, then it’s not going to make good trellis – try something else! As trellis usually only fastens to the inner side of each chain loop, the outer sides of the chain stitch form a neat border. Trellis was widely used in late 16th and early 17th century English embroidery, but then not used again in England until it was rediscovered in the twentieth century, when the old embroideries were studied in detail. However, in Italy the stitch remained as a form of lace called Puncetto Valsesiano. 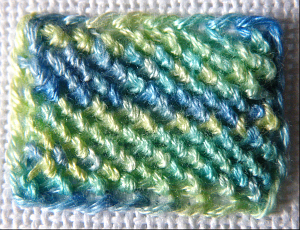 This is a trellis stitch fabric, worked in alternating rows, punto in aria, using the smooth side as the right side. It is varied with little bars, increases, decreases and open spaces to make a sturdy needle-lace. What is more, it has been worked in the Piedmont area since the sixteenth century – a continuous link with the Renaissance stitchery that brought the Trellis family into English embroidery, and a form of lace that is still very little known outside of Italy. A web search on Puncetto Valsesiano will provide you with links to photos, videos, instructions and pattern books. Below are the links to step-by-step instructions for five trellis fillings. The stitches do not need to be worked on evenweave fabrics; but to make things easier for learning the techniques, I have used 28-count fabric and three strands of stranded cotton (floss), for all the examples. They were worked with a size 24 tapestry needle. I suggest that you start with the same materials. You can experiment with other fabrics and threads afterwards. 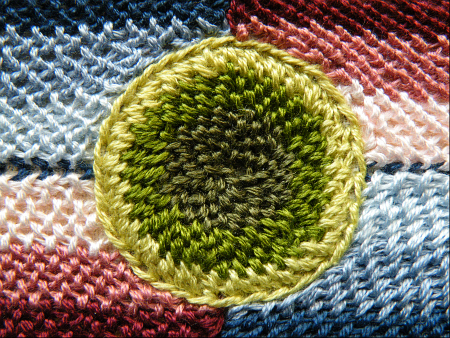 A frame or hoop is not required – the stitches are much easier worked in the hand than in a frame, as with most knotted, looped or chained stitches. There is no need to work every variation shown here, but please start with Variation 1, as it covers the basics in detail. For each of the first four variations, you will need to make a rectangle of chain stitch, with each chain worked over three threads. Make the rectangle eight chains wide and six chains high. Again, the right-to-left version gives a mirror image. Is there any difference in the workings for left handers? Not really, because both v1 & v3 go in both directions (and the others can be reversed). Anyway, left-handed people vary almost as much as trellis stitch! (Me, being only a ‘mild’ leftie, I tend to turn the work somewhere between 60 and 90 degrees to the pictures, but still follow right-handed instructions happily without even thinking about it. Others always want to mirror things.) This is why I have deliberately avoided showing hand positions as much as possible: so that people can look at the structure of the stitches and figure out their own most comfortable working methods. Thankyou ….. 🙂 It reminds me of working PBS – how it best suits *you*. Really thank you so much for all this instructions, finally I have Trellis clear in my mind !! I am very glad you found them helpful, Francesca. Finally, finally, finally with the help of your instructions I mastered this stitch. Using Danish flower thread and it works up like a charm. Thanks. Thank you for letting me know, Zitella. I’m really glad this information was useful. I haven’t tried flower thread for trellis but I’ve found similar threads work well. Have fun with it! Wonderful place to send people to explain just how it is done, many thanks.